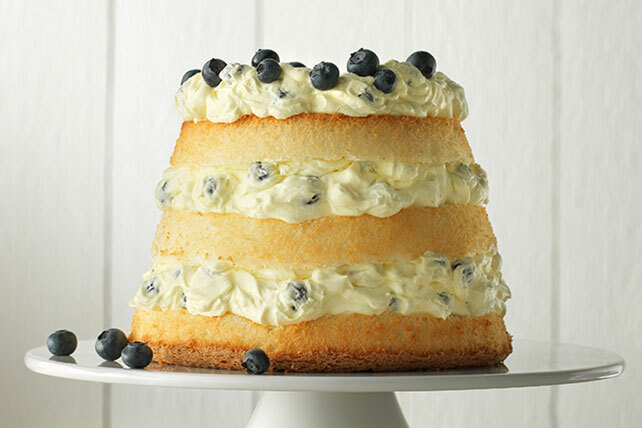 Our Angel Lush with Pineapple was a huge hit, so we thought we'd try it with lemon and blueberries. Behold: a new kind of lush-iousness! Beat pudding mix, lemon zest and milk in medium bowl with whisk 2 min. Stir in COOL WHIP. Refrigerate 5 min. or until thickened. Stir 1 cup blueberries into pudding mixture. Stack cake layers on plate, spreading pudding mixture between layers and on top of cake. Refrigerate 1 hour. Top with remaining blueberries just before serving. Prepare using 1 pkg. (1 oz.) JELL-O Lemon Flavor Sugar Free Fat Free Instant Pudding, fat-free milk and COOL WHIP LITE Whipped Topping.